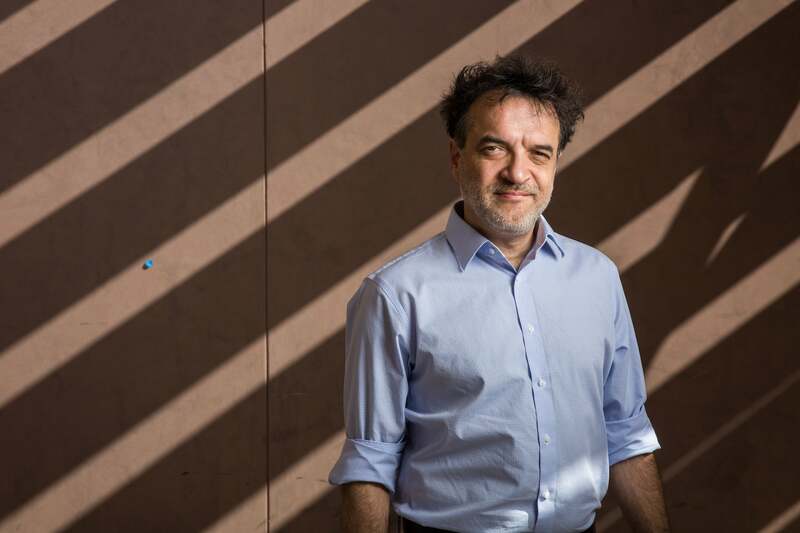 Arizona State University professor Lance Gharavi is an experimental artist and scholar who has a knack for linking with interdisciplinary teams to explore difficult subjects through multimedia performances. Gharavi is an actor, director, performance artist, writer, designer and early pioneer in the field of digital performance. Yet he’s most comfortable at the intersection of art, science and technology, where he and others can collaborate on projects that advance ASU research. His most recent projects have involved research robots and artificial intelligence, planetarium systems, the interior structure of Earth, and currently he’s involved with a research project for a NASA-designed satellite that will measure Phoenix’s urban heat islands — unlikely topics for stage and screen. Question: How do you view yourself given that your work cuts across so many disciplines? Answer: I am absolutely an artist first and foremost. I am by no means a scientist. All of my training is in the arts. I have three advanced degrees, all in the theater. I am, however, an appreciator of science. I am a booster of science. I think science is already interesting. It’s already compelling and fascinating. I just put it through the filter of my own sensibilities, the sensibilities of the other artists I work with and we channel it into the medium of live performance. Scientists and artists are great storytellers, but sometimes we use different language to tell the same story. The most exciting thing is that when artists and scientists come together, we can produce new knowledge and advance the science. Q: You have a clever way of presenting science in a way that’s entertaining and useful to an outside audience. A: Maybe, sure. Science is all around us. Science is the best method we’ve found to discover what is actually the case for what we call “the natural world.” I’m interested in stories. Big stories. I’m interested in ideas. Big ideas. Science is one of the few places where we keep our biggest stories, and our biggest, grandest, most useful ideas. When you simply tell those stories, communicate those ideas, it’s not that difficult to make those ideas compelling. It’s already compelling. It’s already wondrous and magical. Sometimes it’s just a matter of being the finger pointing at the moon. Q: I saw a sneak preview of “Beneath” last year, your multimedia production that explores the Earth’s core. How did that project come to fruition? That’s crazy! We know the mass of the moon and Jupiter, we know what the center of our galaxy smells like, but we don’t know what these blobs are just a couple of thousand miles beneath us? It blows my mind and, frankly, scares the crap out of me. It could be anything. This project started pretty much how every other project starts — me being astonished, amazed and a little creeped out. We plan on turning “Beneath” into a 60- to 90-minute presentation in 2017. Our hope is to take it to space museums and planetariums around the United States. Q: You are also involved in NASA’s "Phoenix" CubeSat project, a small satellite about the size of a loaf of bread that will measure Phoenix’s urban heat islands. I’m curious as to how an artist got linked to this. A: ASU received a $200,000 NASA grant last May to assemble a team of undergraduates to design, build and operate CubeSat, which is a small, functional satellite. The key here is that the 25-member team is entirely composed of undergraduates from engineering, science, journalism, sustainability and the arts. The faculty is strictly in a mentorship role. Jake Pinholster and me recruited students from the Herberger Institute for Design and the Arts and from the School of Film, Dance and Theatre who we thought would be interested in a very interdisciplinary project like this and put them on a team. They’ll be creating a website, a social-media site and a series of short videos about the project and the people involved. NASA’s going to cover the launch and flight costs. How cool is that? Q: Your work with robotics and artificial intelligence is also noted. I saw a recent tweet of yours regarding the Dallas Police Department’s decision to use an armed robot to kill a sniper. It struck me that this bothered you. A: It’s a big deal. Certain kinds of machines like drones have been used by the military to kill people before. But in this instance with the shooter in Dallas, it was the first time that police have used a robot to kill someone. So “Robocop” is here. It’s no longer science fiction. It’s creepy, right? A robot killing people … isn’t that what the premise of “The Terminator” was all about? Work that advances the science of robots is a little more of an awesome responsibility. The work we’re doing will never bring about the robot revolution — knock on wood. But one of the things the most serious philosophers and futurists — people like Stephen Hawking, Bill Gates, Nick Bostrom — are really worried about is the impact of increasing automation through robotics and artificial intelligence on basic human life and causing unemployment. We might be facing a future, not too distant from now, where we could have up to 50, 60, 70 percent unemployment because of artificial intelligence, automation and robotics. That would require the radical rethinking of the social contract and likely cause mass disruption and political and social unrest. Beyond that, these very serious thinkers are concerned with artificial intelligence as a possible existential threat to our species or even enslavement. So if that were the case, what use would we be to creatures like that? What would creatures like that do with us? The answer is, whatever they want. When you’re working with technologies that could someday cause disruption in economies and societies, or species extinction, or can kill people through the police, you take those things seriously. In order to be a responsible artist, you must take those things into account.